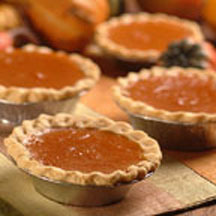 These miniature pumpkin pies are a great choice for Thanksgiving—and other holiday—dessert buffets. Combine sugar, salt, cinnamon, ginger and cloves in small bowl. Beat eggs lightly in large bowl. Stir in pumpkin and sugar-spice mixture. Gradually stir in evaporated milk. Pour into shells. For Lower Fat/Calorie Pies, substitute NESTLÉ® CARNATION® Lowfat Evaporated or Fat Free Evaporated Milk. Note: If using metal or foil pans, bake on preheated heavy-duty baking sheet.